Worklight, the leading HTML5, hybrid and native mobile app platform for smartphones and tablets, is launching a special program to enable enterprise and ISV mobile developers to take full advantage of its award-winning technology, offering free download of its fully-featured mobile application platform for evaluation purposes, self-guided technical tutorials and more. Enterprise and ISV mobile developers are invited to get started at http://www.worklight.com/download. Worklight is the only provider of Mobile Enterprise Application Platform (MEAP) and Mobile Consumer Application Platform (MCAP) technologies that enable developers to build apps using HTML5, native coding or a hybrid combination of the two approaches, without use of interpreting or compiling layers and without locking companies into proprietary vendor-specific APIs. Worklight also enables use of popular development technologies such as Sencha Touch, jQuery Mobile, and Dojo Mobile, as well as cross-platform frameworks such as Adobe PhoneGap, all within the same mobile project. 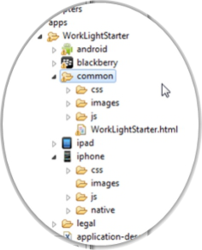 The Worklight Mobile Platform consists of the Worklight Studio, an Eclipse-based IDE for flexible multi-platform development; the Worklight Server for secure delivery and backend integration; the Worklight Console for ongoing management and dynamic control of applications and infrastructure; and the Worklight Device Runtime for accessing native device functionality, UI features, and other runtime application services. Worklight remains committed to a Service-Level Agreement (SLA) that guarantees support for all new mobile devices and operating systems updates, covering iOS, Android, RIM, Windows Phone and supported Mobile Web Browsers, within 30 days of their release to the market. Worklight is the most open and advanced mobile application platform and tools software for smartphones and tablets. Our award-winning products help organizations of all sizes efficiently develop and deliver HTML5, hybrid and native applications with a powerful and flexible mobile IDE, next-generation mobile middleware, end-to-end security and integrated management and analytics. Worklight dramatically reduces time to market, cost and complexity while enabling better customer and employee user experiences across more devices. To download a free 30-day fully-featured version of the Worklight Mobile Platform, please visit http://www.worklight.com/download.